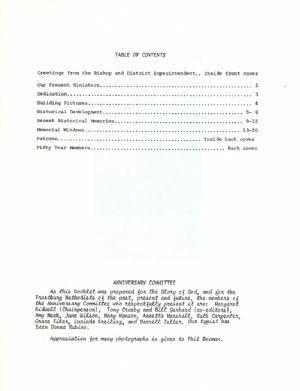 As this booklet was prepared for the Glory of God, and for the Frostburg Methodists of the past, present and future, the members of the Anniversary committee who respectfully present it are: Margaret Kidwell (Chairperson), Tony Crosby and Bill Gerhard (co-editors), Amy Meek, June Wilson, Mary Hanson, Annetta Marshall, Ruth Carpenter, Grace Filer, Lucinda Kreiling, and Darrell Zeller. Our typist has been Donna Rubino. Appreciation for many photographs is given to Phil Beeman.